What comes to mind when you hear the word stress? Is it juggling family and career? Or perhaps the demands of ministry endeavors are weighing you down. Whatever your personal situation, stress is something we all can personally identify with. 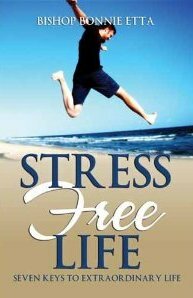 At the time the opportunity to review Stress Free Life: Seven Keys to Extraordinary Life by Bishop Bonnie Etta presented itself, I wasn’t feeling much stress but who couldn’t use some extra tools for handling stress effectively. The Creative Force of Faith–illustrates how faith is the necessary building block for our lives. Cowards die in silence; they are influenced by people’s opinions, people’s appearances and even by the environment in which they find themselves. Cowards die with truths they never experimented; they die with life-giving keys they never used. They die with words they never released because of fear. Needless to say I re-discovered that I’m a coward. Stress is based upon false pictures and based upon false ideas regarding yourself and the situation you may find yourself in. Stress hates to face the truth, stress hates truth. Many times I have been worried about something but when I actually faced the situation, it wasn’t near as bad as I had conjured up in my mind. The author not only addresses individuals but the church as well. The body of Christ is sick today in many countries because the various Christian bodies or denominations have lost their focus. Therefore their followers have no purpose and have nothing to do after being saved except to pay tithes and offerings. Poverty is born out of unbiblical way of life practices. Poverty is not a blessing from God; it does not have the nature and image of God. It is caused by foolishness, ungodliness, wicked political systems and caused by the enemy of human life; the devil. Bishop Bonnie Etta is the senior pastor and founder of the World Vision International Worship Center in Beltsville MD, one of the fastest growing multinational nondenominational church. He is an international conference speaker, author, counselor, and singer and oversees the World Vision Outreach ministries. He holds a Masters in Ministry and he is the author of another book entitled Becoming Your Dream, which has given hope and courage to millions around the world. Disclosure: I was provided a complimentary copy of this by Bostick Communications as a part of their blogger review program. The opinions expresses are my own. Though I'm unfamiliar with the author, I do enjoy reading the book reviews you share with this community. How interesting and I must say, I 'm a coward right there with you. That is something I struggle with, but that I know I am overcoming by God's grace. I will pray that you do as well. Thanks for the review. I see posts like these as God's little reminders that we may be stuck in a certain place, but we don't have to stay there. Have a blessed and wonderful week Sis. A most interesting review of the author about stress, it has the opposite views I have read about stress over the years, aliet very good I'm sure both ways of dealing with stress has the same outcome, as I believe you have to BELIVE what you're reading. It was my first time reading any work from this author, MTJ. Lisa, I'm glad to know that I'm not that only one that tends to be a coward at times but you're right we don't have to stay that way. Hope you have a great week too! Yvonne, it was definitely a different take on handling stress. I don't know if we'll ever be totally stress free in this life. Besides stress can be both good and bad. Thanks Wanda. That word "fear" and stress are so tied together. It will spin you in circles until you fall in complete exhaustion. My motto is always to fight fear using God's word….daily. Now that's a wise motto, Blue! We have to use the weapons God has provided us.